The University of Maine at Presque Isle’s Outdoor Adventure Program International [OAPI] is offering a series of fall adventures and activities for campus and community members to enjoy, including an overnight trip to Deboullie and a caving trip to New Brunswick. The fun began in late September with a White Water Rafting Trip with New England Outdoor Center on Sept. 22. This will be followed by a fun hiking adventure on Sunday, Oct. 14 – the Aroostook High Peaks Trifecta. This involves climbing three peaks in one day, Haystack in Mapleton, Quaggy Jo at Aroostook State Park, and Big Rock in Mars Hill. The van will depart from Gentile Hall at 8 a.m. Cost is $20 for UMPI students, $25 for non-students. On Friday, Oct. 19, all are invited to attend the High Ropes Course Open House, a chance to experience UMPI’s adrenaline-rushing ropes course first-hand. Participants will have the chance to climb a telephone pole to 40 feet above the ground and test their fear of heights as they cross the course’s cables with four different challenges. This activity will be held from 1-4 p.m. Meet out at the high ropes course area on campus. Follow the bike path past the tennis courts and the course will be on your right before the railroad tracks. This event is free for everyone and no experience is required. That weekend, from Saturday, Oct. 20 to Sunday, Oct. 21, OAPI will host a Deboullie Overnight Camping Trip. The trip allows participants to paddle and hike in one of the most beautiful spots in the North Maine Woods. No experience is required. The van will depart from Gentile Hall at 8 a.m. The registration deadline is Wednesday, Oct. 17 in Gentile Hall. Cost is $65 for UMPI students and $80 for non-students. This fee includes transportation, gear, food, and professional guide services. On Friday, Oct. 26, OAPI will take to the mountain bike trails at the Nordic Heritage Center in Presque Isle, for an afternoon of premium single-track riding. The van will depart from Gentile Hall at 1 p.m. Cost is $5 for UMPI students, $10 for non-students. Some mountain bikes are available on a first come first served basis. Just two days later, on Sunday, Oct. 28, OAPI will lead an Outdoor Rock Climbing Trip to Acadia National Park. The trip includes a full day of rock climbing on the cliffs at the scenic park. The van will depart from Gentile Hall at 5:30 a.m. The registration deadline is Wednesday, Oct. 24 in Gentile Hall. Cost is $30 for UMPI students and $45 for non-students. This fee includes transportation, gear, snacks, and professional guide services. 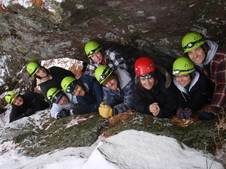 Finally, OAPI will end its fall season with a Caving Trip to New Brunswick on Sunday, Nov. 4. The van will depart from Gentile Hall at 7 a.m. The registration deadline is Wednesday, Oct. 31. Cost is $30 for UMPI students, $40 for non-students. No experience is required. Participants must have passports. If you plan to head out on an adventure of your own, keep in mind that OAPI rents out gear – including snowshoes, skis, tents, sleeping bags, canoes, and kayaks — for a nominal fee, including a $20 deposit at the time of rental. Those wishing to take advantage of OAPI rentals are advised to check on availability and reserve gear in advance through Amanda Baker, UMPI’s Recreation Programs Coordinator. For more information about rentals or any of these fall events, contact Baker at 768-9401 or amanda.g.baker@maine.edu.